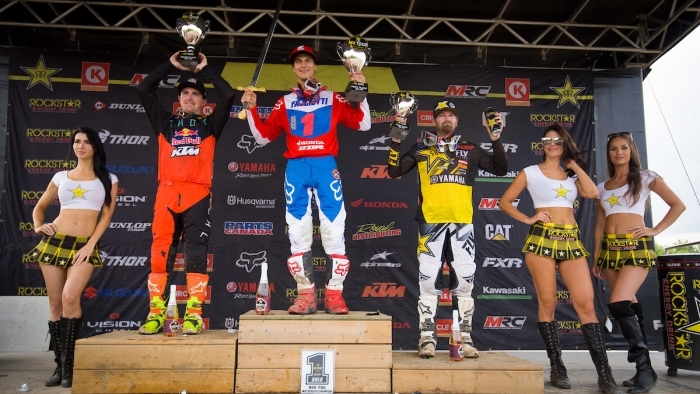 Although defending champion Goerke, who had to deal with some set-backs this season, was unable to reel in a fourth 450 Pro title, he assured team Rockstar Energy OTSFF Yamaha a third-place ranking in the points chase behind runner-up Cole Thompson and new champ Colton Facciotti. Epstein, who also had his share of misfortune to deal with, still managed to improve on his 2017 No.7 ranking, claiming the No.6 plate when all was said and done. Like at most of the eastern rounds this season Walton’s weather proved to be hot and humid, with the thermometer hitting 27°C but feeling more like 35. Although rain is almost a given at some point during the Walton TransCan GNC, which features four days of amateur racing before the pros’ final showdown, the rain did come on Thursday but held off on Saturday. The classic style Walton Raceway track was in perfect shape for the championship-deciding pro features: the racing was on the edge in both classes, with blistering speeds that separated the men from the boys. When the gate dropped for the first 450 Pro moto the main players in the title hunt were all within the top-10 going into turn one, including Goerke in eighth. Epstein was a bit farther back in 13th. It took Goerke only a few laps to install himself in third place behind second place running Facciotti and holeshooter Tyler Medaglia. The three motocross veterans lay down such a relentless pace up front, by the time the checkered flag was waved there was a 25-second gap between third and fourth place. The rest of the field was looking at over a minute’s worth of real estate behind the leaders. Despite Goerke and Facciotti pouring on the gas to improve on their positions, Medaglia crossed the finish line 1.582 ahead of Facciotti, with Goerke bringing home third place 2.744 seconds behind Facciotti. Epstein, meanwhile, had worked his way from 13th into fifth place on lap six. At that point a rock got stuck in his rear brake, which took him two laps at a slower pace to get dislodged and get the brake working again. By then he was in ninth place, which he exchanged for eighth by the time the moto was over. The start of the second moto again saw Goerke and Epstein outside of the top-five. Goerke, who held down sixth, parlayed that into fourth by the end of the lap. He then made a mid-moto pass on third place running Medaglia. Ahead of Goerke were second place running Cole Thompson and leader of the pack Facciotti. As in the first moto Goerke pinned the throttle in an attempt to move into second and set his sights on first, but he would eventually have to settle for third at the finish line. Regardless, Goerke did what he had to do to move from fourth in the points chase back into the top three, as he and Medaglia were tied for third place after Moto 1. The two extra points he earned over Medaglia with that result were enough for Goerke to secure third in the final 2018 MX Tour 450 Pro rankings. Epstein, who started in eighth place, battled his way into a fifth place finish, which was more than good enough to secure a sixth place ranking in the final points standings. “Overall the outdoor series was a roller coaster ride for us. We had some great highs and some heart-wrenching lows. We’re ready to refocus on supercross now and finish out the SX portion of the Triple Crown Series strong,” said team manager Steve Simms. Everyone at Rockstar Energy OTSFF Yamaha would like to congratulate Matt and Dillan on their hard-earned finishes in the Triple Crown MX Tour Series. A huge shout goes out to the entire team staff for their hard work behind the scenes. And a big thank you to all our sponsors. Without your invaluable contribution none of this would have been possible. The Rockstar Energy Triple Crown Series reboots on Saturday, September 15th, with Round 1 of the SX Tour at Montreal’s venerable Olympic Stadium.